SAN DIEGO – October 31, 2017 – TVPage, the leading provider of cloud-based interactive video commerce technology, today announced the launch of Taylor Guitars Videos, a new community video destination that allows visitors to experience Taylor Guitars, the largest guitar manufacturer in the world, through interactive content on TaylorGuitars.com, powered by the TVPage Video Commerce Cloud. “Video content is a critically important focus and component of our overall marketing strategy at Taylor Guitars. We believe that video is an extremely effective medium for educating shoppers and guiding them through their buying journey as they research our products online. Taylor Guitars is uniquely positioned to provide expert educational content to consumers, and the TVPage platform allows us to offer that content in shoppable experiences, syndicate and automate the delivery of targeted and personalized video content across our digital properties, and use the platform’s data to optimize our content marketing strategy. Through our partnership with TVPage, we’re looking forward to continuing to building new and innovative ways of connecting with guitar players in an ever-growing, video-centric digital world.” – Scott Reinhardt, Global Director of Digital Marketing at Taylor Guitars. 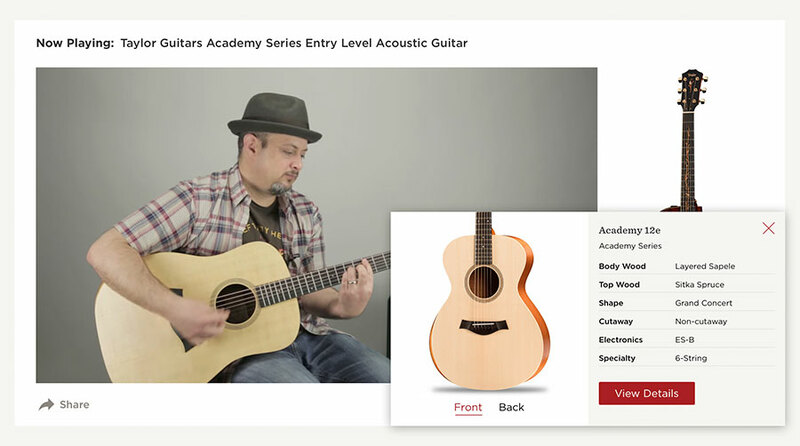 At https://www.taylorguitars.com/videos, users can now access a wealth of educational shopping-related content to aid them in their search, learn how to play and care for their guitars, and listen to artists from all over the world – all in a curated video-first experience. 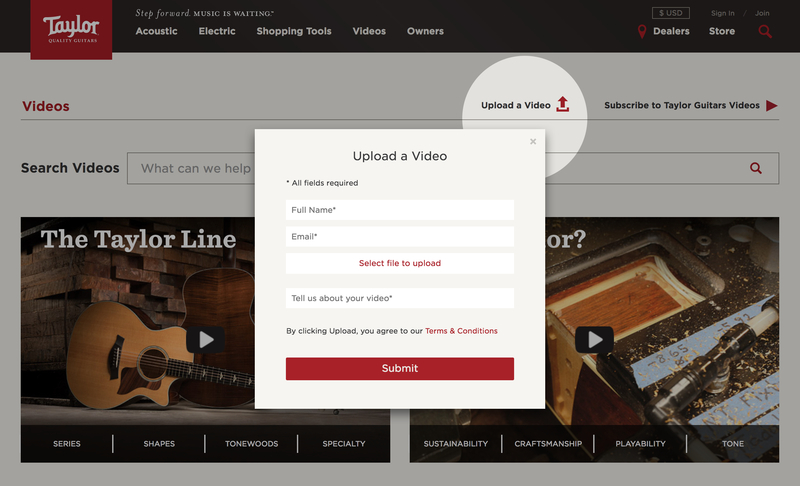 Fans, artists, dealers, and other members of the Taylor Guitars community can now also subscribe to Taylor Guitars Videos and upload their own videos for consideration, bringing together a community passionate about the Taylor Guitars brand and products – something that clearly resonates throughout the new video experience. “Taylor Guitars Videos allows enthusiasts and prospective customers of Taylor Guitars to fully experience the Taylor brand, lifestyle, and company culture, communicated in the medium of choice to consumers who watch, learn and shop on the same device.” – Trip Stern, VP, Business Development at TVPage. TVPage not only serves the highest engaging video for any topic. The system also manages relationships between videos and brands so that the relevant product information is always right there at your fingertips while you watch. Brands and merchants using TVPage’s interactive video content technology, like Taylor Guitars, benefit from an average increase of three to five times their typical conversion rates, compared to visitors watching traditional video content. These numbers emphasize the importance of not only engaging consumers with video, but also ensuring brands’ consumers can seamlessly click on to explore and buy the relevant product while they watch, which is difficult in an overcrowded ecommerce environment full of many brands all vying for consumers’ attention. .
For more information please visit TVPage.com and https://www.taylorguitars.com/.